A courtyard can offer exceptional privacy even in the middle of high density housing. If well thought out and designed, a courtyard offers both visual and aural privacy. Both are important when so many homes today have so little space separating them. Of course, a courtyard isn’t soundproof, but the walls act as a sound barrier and can significantly reduce noise levels. Many home-owners on busy roads have discovered how creating a walled entry courtyard can reduce noise levels by 10, 15 and even 20 decibels. Most town-houses already have one or two courtyards but they may not be well designed. Minor changes can often make huge differences to privacy. In the above example, bamboo is used to for additional screening. A non-invasive variety like Bambusa Textilis Gracilis (Slender Weavers’ Bamboo), will grow happily grow to six metres in a constrained area. Another smaller option would be Bambusa heterostachya variegated (Malay Dwarf) with it’s lovely light green and white striped leaves. 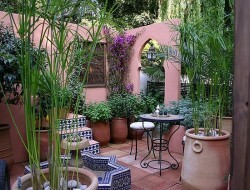 Plan your courtyard, build it and then enjoy it for many years to come. Looking for more inspiring ideas? Keep scrolling!